In general Simple action can be one of the best of the strategy. And for an exam like CAT, the more one remains rooted to the basics of arithmetic, algebra, trigonometry, percentages, numbers and grammar with enriched vocabulary; the more it is easy to ace CAT. That can be termed as the best strategy to compete in CAT. Latest Update: IIMs will announce the CAT 2019 exam date. Detailed notification for CAT 2019 may be released in July / August 2019. Those of you, who have not started preparing for the CAT 2019, may be because you think there is a lot of time left and you can start preparing from tomorrow then dear aspirant – TOMORROW NEVER COMES…. So Start Abhi …. • Have you passed your secondary and higher secondary exams, especially the Math’s exam? • Do you remember the Grammar that your English teacher in school drilled into you? If yes, then the remaining days are more than enough for you to prepare for CAT and make it to any of the best b-schools. It is rightly said, "He who fails to plan, plans to fail". Nobody can undermine the importance of planning when doing any important task, and if it means preparing for the CAT exam, you should be even more careful. So, go and get yourself a balanced study plan, assign yourself time limits and some chapters to study every week so that you are able to complete your syllabus in time. To score well, you need to know what sections the test paper consists of. CAT consists of Quantitative Aptitude or mathematical aptitude, Verbal Ability or your English language skills, Data Interpretation or your analytical skill and Logical Reasoning to test your logical thinking. The Quantitative Ability section consists of the topics of Arithmetic, Algebra, Geometry, Trigonometry, Mensuration and all those topics which you have studied till class X. The topics covered in Verbal Ability are reading, grammar, comprehension and vocabulary. The questions on Data Interpretation and Logical Reasoning are on Graphs, Charts etc. It is very important to know the exam to ace it. Plan your preparation after knowing your strengths and weaknesses. For this you should take a diagnostic test as it will tell you where you stand. You can plan the journey to the destination well if you know the start point. So, identify your strengths and weakness and work out a strategy based on your strengths. Like you can be strong in QA, average in DI & LR and a bit weak in VA. Then you should plan your exam strategy based on your strong area and attempt QA first so that you can score maximum in that section within stipulated time. You should always remember that cracking CAT is all about time management. Also, you should plan to turn your weaknesses into strengths and ignore certain weaknesses if they are not important from exam point of you and improve your strengths. When you get a grip over the basic syllabus of the CAT exam, you should start taking regular mock tests to know your preparation status. Also you must see if you are improving after taking the tests and analyze your performance. You should also try to improve with each successive mock test. Take these mocks very seriously and your hard labor will surely reap reward. You must understand that CAT is not impossible to crack. People have done it before and will continue to do it, so why not you? You just need to continue systematic preparation and CAT could be probably one of the easiest tests to crack. Besides 20 IIMs, more than 100 B-Schools take CAT as a standard written test. Your idea of getting into a good B-School starts with CAT and such exams, and the route to the same is not as difficult as it is made out to be. As mentioned earlier as well – CAT is all about Time management. 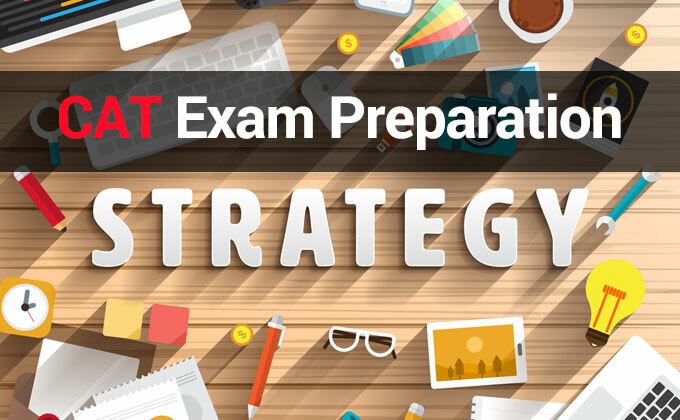 The most important part of any competitive exam is the strategy that you adopt. Given enough time, you will realize that you can solve almost all the problems in the mock test. The fact that the same has to be done within a fixed time and that too by making as few mistakes as possible is what makes the task challenging on the final CAT day. Student from any stream, be it B.E/ B.Tech/ B.Com/ B.A/ B.B.A/ MBBS, can become a manager. Hence, CAT that tries to test students from different streams has to be at a level which is comfortable to all students. The only common level that students from diverse streams have is the Std 10 exam. Hence CAT and other exams test aptitude at that level. Each one of you is capable of getting there if you prepare systematically. There is enough time to revisit your school level math.